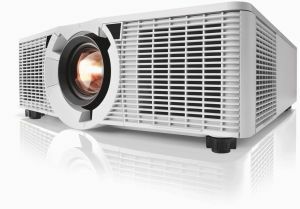 Christi's new 1DLP projector line will have its first showing at the Integrated Systems Europe (ISE) show in Amsterdam Feb. 10-12 at Christie booth No. 1-H50. The Christie H Series projectors feature 12,000 lumens and are available in the10,000-plus lumen 1DLP category. hotels, boardrooms, education, government, conference rooms and houses of worship. The brightness and durability is a boon for rental stagers, while fixed installation applications benefit from not only the image clarity and color integrity, but also the design, enabling the Christie H Series to be installed in portrait or landscape mode. With this announcement, Christie demonstrates its commitment to the 1DLP market, adding to a lineup that includes Christie G Series, GS Series and Q Series to deliver a platform of 1DLP solutions.